A well built Patio is an extension of a homeowner’s living space, combining the indoors with the outdoors, while enjoying nature’s beauty. We give you advice so you can create a fabulous functional Patio that’s so good -you’ll be the envy of all your friends and neighbours- and you’ll never want to entertain indoors again. When designing your Patio it is important to match your home’s current design so the patio becomes an extension of your home, not just a structure to accommodate your bib. For example a traditional federation style house would suit a gable patio with federation trusses and if you fancy a more modern look team up the décor with modern accessories to give that modern touch whilst being in keeping with your house. • Establish true or solar north for your region to encourage or discourage solar access. • You should also consider the impact of adjacent buildings and existing landscape on your site. Of course a reputable Patio Builder will be able to help you with this process or even do it all for you! North to south sites have good access to northern sun with limited overshadowing from neighboring dwellings, while in summer neighbours houses offer protection from low east and west sun. East to west sites are prone to overshadowing by neighboring houses and should be wide enough to incorporate a north facing outdoor space. A north facing slope will increase access to northern sun and is ideal for higher housing densities. A south facing slope increases the potential for overshadowing. The Australian greenhouse office recommends adding a patio above north facing windows to reduce glare and heat from summer sun. Deep patios are suited for east and west-facing walls. • Site orientation. A bad location guarantees an uninviting outdoor area. • How much space you’ll need. Too much space and you’ll pay for space not needed or too small and your furniture may not be fully protected. • What you want to use it for – reading, entertaining or relaxing. How much money you want to spend. A patio should be considered an investment in your home so it’s best not to cut corners. The style of patio you choose should complement your home. 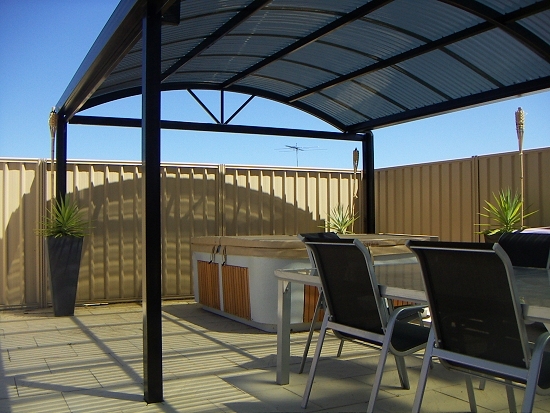 Dome: The smooth clean lines of a dome patio provide a graceful canopy that compliments the look of more modern homes it can be covered in either Colorbond or polycarbonate roofing and is adaptable to different designs. 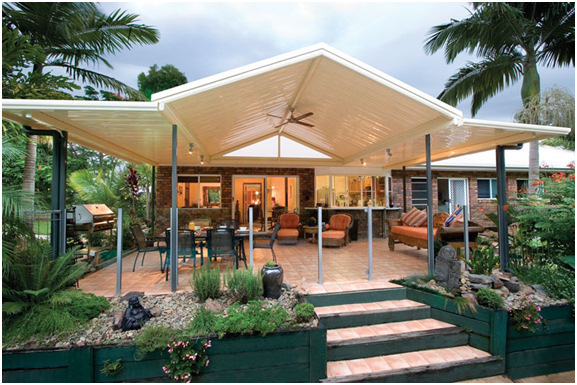 Gable: A very popular and flexible pitched roof style that has great visual appeal and superior spanning capabilities. Suits most styles of homes and can feature polycarbonate or Colourbond roofing. Pyramids/hips: The pyramids/hip patio is constructed with what appears to be one large truss where four equal sides come together to a single point. The Patio provides a feeling of extra height and space. Suites more modern homes and has many roofing options. Flat: The flat Patio still has its place though it is not as popular as the other styles. It comes with either a polycarbonate or Colourbond roof and can look striking if the right combination of materials is used. As its design is so simple it is the most affordable option and can be combined with either a gable or dome for a grander impression. Combination: Is a cost effective alternative large gable/dome, still giving you the grandness of the gable/dome. Steel is the most popular material for patios in WA. Steel is an excellent option for patios as it has the ability to span large spaces and is versatile, durable and strong. It comes with a manufacturers warranty, requires little maintenance and is available in a variety of powder coated colours making it easy to compliment most styles of homes. In areas close to the ocean preventative measures are available to prevent corrosion and keep maintenance to a minimum. Trusses should be fully welded and primed before powder coating, to ensure the patio will be structurally sound. There are two types of gutter systems used for Patios; the first is a kissing gutters which gives the patios an independent gutter system with the water running into the patios own downpipes. This system is preferred as it is completely independent of your house gutter and will not run extra water into your house down pipe which was designs to take water from your house roof only. A box gutter system is recommended if your existing house gutter is old or has defects, this system removes your house gutter and replaces it with a box gutter taking the water from the patio and your house and running it into your house down pipes. If you choose this system ensure the builder installs an oversized down pipe which can adequately cope with the water flow from both roofs. Building laws relating to boundaries, height limits and other regulations vary from suburb to suburb. If the patio is less than nine meters long and is closer than one meter from the neighbouring boundary, it will require planning approval. The same rule applies to patios exceeding nine meters in length that are 1.5 meters closer to the fence line. Most shires will allow the patio to be 500mm from the fence line with neighbours consent. Planning approval is required for patios on any strata titled home. Ensure you choose a reputable builder, who adheres to all building codes and is properly insured. All building works over $7500.00 come under the home building contracts act and must have written step by step contract which complies with the act. A builder may only ask for 6.5% deposit with progress payments after the work begins for work done or goods supplied. You should receive a copy of your building licence and related drawings for your records. Your builder should use structural drawings by a civil engineer made specifically for that building company. We hope this guide has been helpful in assisting you to choose a patio style and builder. If you have any questions or queries please do not hesitate to contact us on 9277 3594 as we would be happy to help. A copy of this guide is located below.